Built in the late 19th century for tanned leather production and renovated into a bicycle factory after WWII, Rog quickly became a synonym for quality bicycles, with widespread popularity across the borders of former Yugoslavia. After the end of their production in the early 90s it was left abandoned for 15 years. In 2006 a group of individuals, students and artists occupied the premises and transformed the factory into a community space for alternative content. Over the next ten years it became home to over thirty collectives and spaces where production spread from socio-cultural activities to arts, sports and activism. In dozens of ateliers, galleries, sport halls, concert and clubbing venues, a skate park, circus, community kitchen, library, bicycle repair shop and social center for disadvantaged groups like migrant workers and refugees, users and visitors can find a safe space away from capitalism and consumerism in the outer world. Recently the municipality claimed ownership of the factory with a violent attempt to evict its users and demolish the factory for their gentrifying idea of a Center of contemporary arts (see CSU Rog). 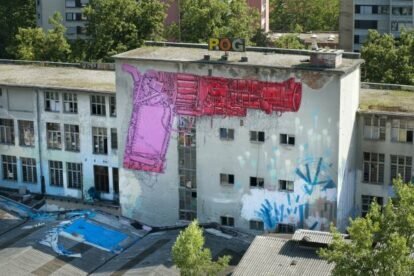 Rog users protested against it with strong support from the media, broader public and foreign artists, like graffiti artist BLU who painted a big mural about all that’s happening there. How much longer will Rog squatters retain their autonomy over production and propriety rights now lies in the hands of the district court and it’d be tragic to lose such an important space of cultural and political alternatives (see Metelkova).